Home > Blog > Product Updates & Releases > Are you using the best Gasless MIG Wire available? 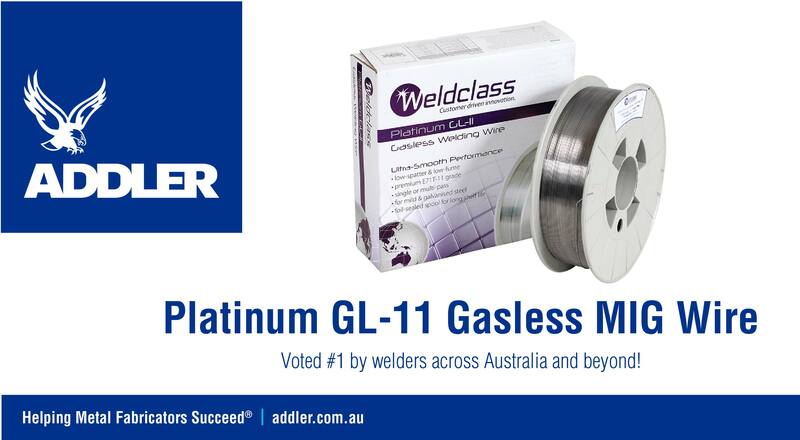 Weldclass PLATINUM GL-11 is the first choice of welders across Australia and beyond. Seriously smooth arc, easy-to-use, low spatter, low fume, easy de-slagging, multi-pass and all-positional. Great for mild and galvanised steels. WHY USE WELDCLASS PLATINUM GL-11 GASLESS WIRE? Don’t just take our word – Check what these fabricators have to say about it! I use the weldclass .09 flux cored wire an love it. Best I’ve used. I’ve used other brands of gasless wire in the past but was always disappointed with the weld appearance, spatter etc. After inspecting the first few GL-11 welds I knew I was onto a good thing and knew I wouldn’t need to try any other brands, I have finally found what I was looking for. I can honestly say none of the other brands I’ve used have come close to the quality of GL-11. It flows smoothly with minimal spatter and weld appearance is also very good. Brilliant for gap filling, extremely easy to fill & doesn’t blow holes! Product Updates & Releases, Tech Tips ADDLER, MIG Wire, Welding Equipment, Welding Helmet. permalink.